I have been battling with my front yard since we moved in. First, I had to get rid of all the ugly things the previous owners planted before (they had an FSU themed garden and I am a UF Gator! Ahh!). But even after that it's been a struggle to keep things looking pretty. At first I thought it was because of the pH or the lack of minerals in the soil. But then the truth emerged: Too much water. So we amended the soil and rerouted the irrigation system. We are hoping that will fix it! What do you think? Geraniums on each corner, except where the blue daze is and then the blush breathless euphobia in between the red flowers. The lime tree is blooming like crazy too, but you can't see it in this picture. Here is a picture of the side yard. I can't wait for the crape myrtle to bloom! 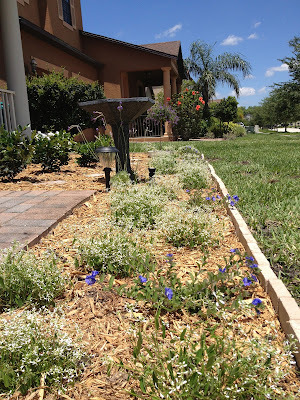 The white plants in the back are Snow White Plumbagos. They really have taken off since I planted them only a couple of weeks ago. The shrubs in front of them are privets. The look smaller in the second set of pictures because I did a pretty aggressive pruning, but they are doing well. 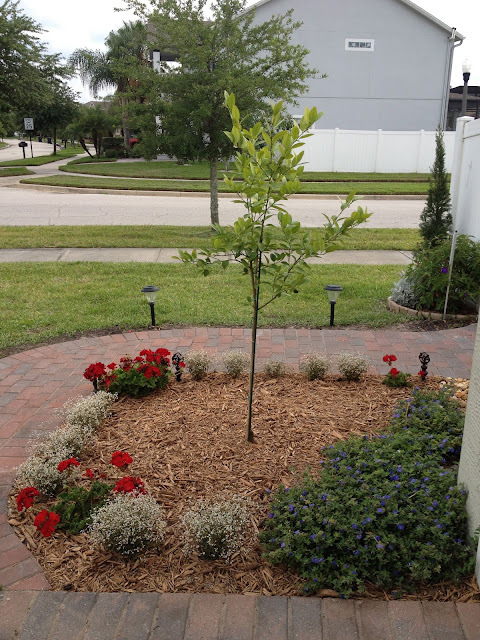 The two plants flanking the entry way are Podocarpus. The white plants in the front are Euphorbia plants: Diamond Frost. They have gotten really white and fluffy quickly. They remind me a lot of baby's breath. 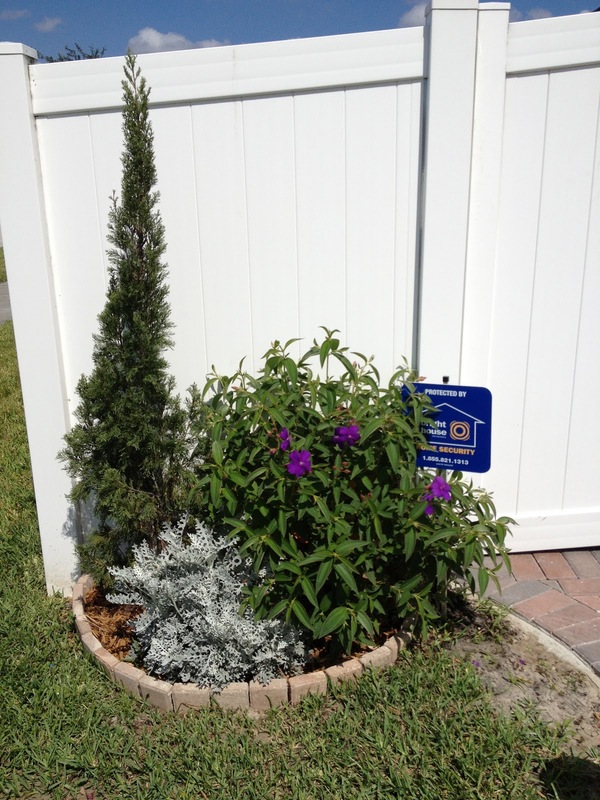 The small tree is a Sapphire Showers Duranta. It's such a pretty little tree and it's made good friends with a bumble bee. Apparently, the tree is a humming bird, bees, and a butterfly attractor. We put the tree in a clay pot which I partially seals and painted. We buried it because wanted the clay to act as a wick and absorb some of the excessive moisture since we had been having problems with water in that area of the garden. We also decided to bury it to the rim of the pot so that it look more like a border than a pot. I really have no idea if the clay is helping with the moisture in the garden, but I think it's pretty. The blue plants in the middle of the Euphorbia are blue daze. I love those little plants! They are tough, pretty, and really hard to kill. They stay pretty low to the ground and spread out a bit, but they are always covered in bright blue flowers. 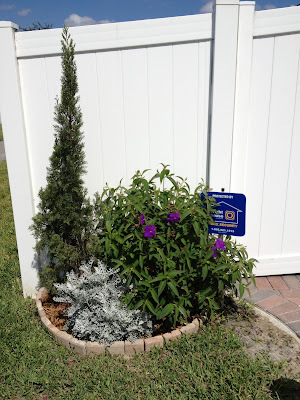 I planted some lavender next to the bird bath, but it hasn't filled in very well yet, but it was put in only last week so it hasn't had time to fill out like the other plants. 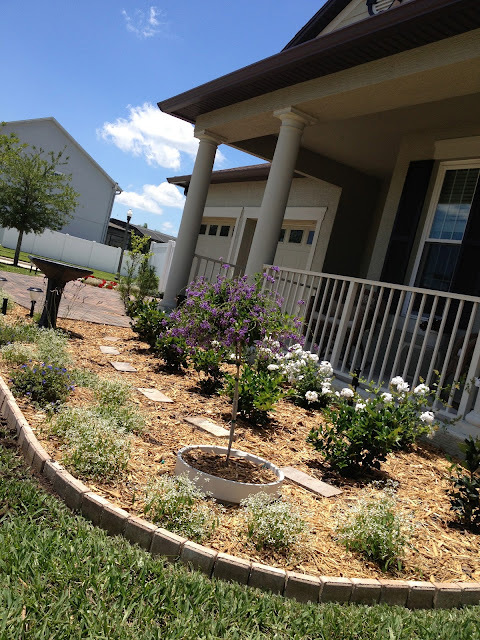 We changed the mulch because I had been using rubber mulch to cut cost, but with the clay soil it is important to use materials that will decompose and add back into the soil. I liked the tone of the cypress wood. I thought it was a little more homey. However-- I am still using the rubber mulch in the back yard. I'm not throwing that stuff out! It was expensive! Pesticides in my produce? No thank you! GMO Foods- Does It Matter?